Camping Marina d'Erba Rossa - Luxury camping when it is best! Marina d'Erba Rossa offers holidaymakers a unique opportunity to experience luxury camping at its best. 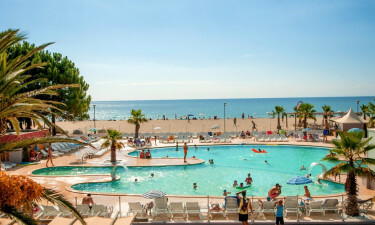 This four-star holiday camping site appeals to luxury campers and families with young children in search of an unforgettable holiday in Corsica, one of the most sought-after destinations in the Mediterranean. Book your stay in Corsica with Lux-Camp to experience it by yourself. 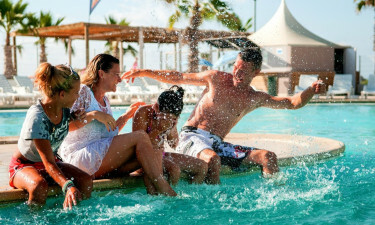 Enjoy your family holiday at Camping Marina d'Erba Rossa. Why should I camp at Marina d'Erba Rossa? This luxury camping is ideally situated in Corsica's eastern coast. Staying at Marina d'Erba Rossa will allow you to explore this outstanding area, which is packed with secluded beaches, hiking and cycling trails, and beautiful mountain villages. This is the ideal holiday destination for anyone looking to escape from routine and spend a fun-filled break under the sun. Marina d'Erba Rossa offers high-end accommodation in spacious landscaped plots that offer all the privacy needed for a relaxing holiday by the sea. All mobile homes are modern and fully equipped with all amenities needed to make your stay comfortable, including a fridge freezer, a coffee maker, a stove, kitchen utensils, and a BBQ area. Other amenities include shaded outdoor space and a fully furnished patio where you can enjoy dining or simply relax with a good book. Experience camping luxury first hand thanks to Marina d'Erba Rossa's wide range of amenities. 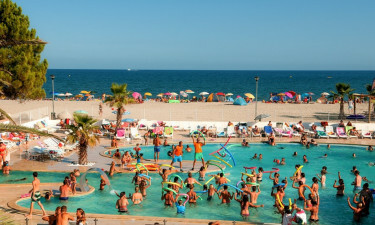 The campsite has a swimming pool overlooking the beach and offers direct access to a golden sand beach. Children will love the dedicated playground and the animal park, whereas adults can relax at the site's spa, use the tennis and basketball courts, or enjoy a drink at the on-site restaurant. Marina d'Erba Rossa's on-site restaurant is an open-air venue that serves international cuisine. This luxury campsite also has an ice cream bar and a creperie that make for an enjoyable after-dinner stop. Traditional bars, restaurants, and cafes are only a few miles away in Ghisonaccia town. Camping Marina d'Erba Rossa has an on-site supermarket selling all essential items for a camping holiday. For all other necessities, you can head to Ghisonaccia, where you will find souvenir shops, grocery stores, a fresh produce market, bakeries, and pretty much everything you need to enjoy your stay on the Corsican seaside.